Elephant Room Gallery is excited to present “Fourteen to Seventy-Four,” a collection of paintings by James V. Allen. An opening reception will be held on January 7th from 5pm – 8pm and the show will be on exhibit through January 19th. “Fourteen to Seventy-Four” can best be described as a haunting and honest interpretation of the lives of African Americans both past and present. 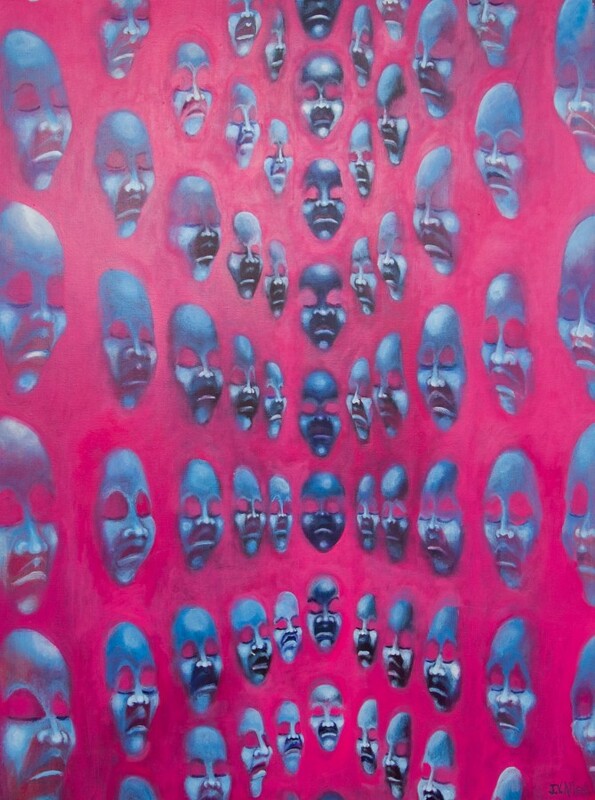 The works are visually captivating through Allen’s use of color, haunting facial expressions and repetitive patterns. Each piece has a background story that is unequivocally linked to the visual that even without knowing the inspiration, the viewer can begin to decipher it. The title of the exhibition comes from the age range of African Americans that have been shot by police. James V. Allen was born in Hollywood, California where he eventually came to study art at the Trade Technical College and participate in many group shows. He then came to Chicago in 1998 to be with his sister who was ill. Before she passed away of breast cancer, she imbued him with the desire to stay in Chicago as an artist. Allen has been working in Chicago since 2001.